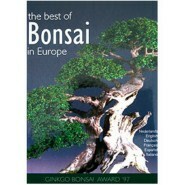 This is a photo book on the bi-annual Ginkgo Bonsai Award. It is a book full of excellent, professional photographs of high quality bonsai specimens. If you are looking for inspiration for you own bonsai and excellent value in a beautiful book, look no further. 128 pages | Full Colour | Over 150 Photographs | Soft Cover. Country of origin: The Netherlands. You will earn 25 points which is the equivalent of €2.50 when ordering this product.